It’s a common notion that when we go on vacation we want to “get away from it all.” But take a closer look and you may find that what you really want to do is get away from it all with the technology you love. But what gear should you haul along with you? That depends a great deal on how you’re getting from here to there, whether this is a working vacation, where you’re going, and who you’re visiting along the way. The means you choose to travel will influence what you take. If you’re flying, you’ll want to pare it down so that valuable gadgets—camera, laptop, tablet, and portable entertainment device—can be placed in your carry on. I prefer to throw that stuff in a backpack that fits under the seat in front of me, thus saving an overhead bin for a bag containing items that I won’t need during the flight. Placing the bag within reach ensures that can get to your toys at all times (except during takeoff and landing, of course) plus relieves you of the worry of it being tossed around by careless baggage handlers. If you have to travel light you must make some tough choices. Laptop or iPad? Point and shoot or DSLR? Hardback book or Kindle? (Okay, that one’s not hard at all.) It’s a balancing act. How much can your bag hold? Is your iPhone good enough for the snapshots you want to take? And how much weight can you stand to carry when you hop off the plane? A checkpoint-friendly bag If you’re going by plane and would like to move through the security line a bit faster, the first step is to get a “checkpoint friendly” carry-on bag. These are bags designed to make it easier for airport-security personnel to see the contents of the bag's computer compartment. Some use a slide-out computer sleeve, while others unfold so that the laptop compartment lays flat—by itself—on the scanner belt. An Amazon search for checkpoint friendly bags produces scads of results. Orderly cables Additionally, when packing, try to not create a rat's nest of cables and connectors. (See Dan Frakes' tips for creating a cable travel kit.) A poorly packed bag may result in having the bag hand-checked, which can be more than a little inconvenient if you’re late for your flight. A keyboard for comfort If you’re traveling by car and have plenty of trunk space, you have more options. Unsure whether you can stand typing on an iPad for a week? Pack a wireless keyboard like the Logitech Tablet Keyboard for iPad ($70), Logitech Wireless Solar Keyboard K760 for the Mac and iPad ($80; ), or Apple's Wireless Keyboard ($79; ). Still not convinced that an iPad can handle all the tasks you demand of it? Take the laptop too. Speakers Love music but pretty sure your lodgings will offer nothing more sonically substantial than a bedside clock radio? Bring along some powered speakers. 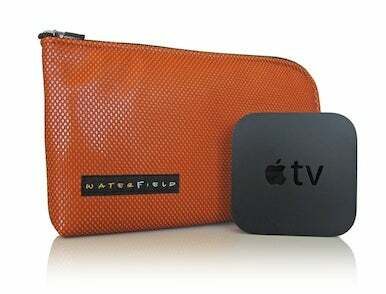 Bring your Apple TV along with WaterField Designs' Apple TV Case. A traveling entertainment system Assured of a decent broadband connection but limited TV programming? There’s always room for an Apple TV. In fact, WaterField Designs' $45 Apple TV Case makes a great travel pouch for the Apple TV, power cord, HDMI cable, and Apple Remote. One warning: If you’ll be connected to the typical hotel “high-speed” network, forget about streaming movies. These networks are almost always unacceptably slow. In such cases, pack some movies with you. Put a few directly on your iOS device or laptop, bring a portable hard drive loaded with movies and jack it into your laptop, or store media on a Wi-Fi-enabled hard drive that lets you stream directly to a computer or iOS device. If you have an older laptop with a SuperDrive, bring some DVDs. It's easy for kids to share an iPad when you attach it to a car headrest. Accessories like Modulr's Car Headrest Strap can help. Car travel and kids is another consideration. Unless you enjoy choruses of “When are we going to get there! ?” repeated every mile marker, bring entertainment. iPad sharing tips An iPad is a great companion in that its screen is large enough to share. 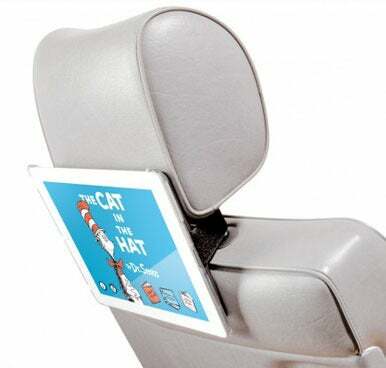 With the correct case, for example Griffin Technology's $25 CinemaSeat or Modulr's iPad case with a $20 Car Headrest Strap accessory, you even can mount it on a seat for group viewing. If you have more than one child, more than one iOS device, and your kids have a hard time sharing, give them each something to watch. Toting along some kid-friendly headphones, such as Griffin Technology’s $25 over-ear Crayola MyPhones or Etymotic Research's $49-$79 EtyKids 3 earbuds ( ) is a good idea as well. (Bring a headphone splitter if kids will be sharing a single device.) These headphones are made for kids' smaller heads and ears, they're inexpensive, and they limit the maximum volume. No matter how high your kid cranks the volume, he or she can’t damage his hearing. They offer a distinct advantage to parents as well. Some drivers have difficulty concentrating when hearing the dialog from The Little Mermaid for the 67th time. Pack the headphones if you have kids in the car. Favorite kids' apps To make sure your iPad or iPhone are fully stocked with kid-pleasing apps, check out "2012 Summer road trip apps: Elementary school favorites" and "2012 Summer road trip apps: Preschool favorites." Many people continue to work while on vacation. Oftentimes this requires little more than keeping up with email and some light web browsing, in which case an iOS device can handle the job admirably. But if you need to do more, a laptop offers full-blown applications and more storage flexibility. Make sure that you not only have the applications and files you need, but a way to access remote files, either because they’re generated in your absence or you’ve forgotten them. Dropbox, just in case Before I leave on a working vacation, I put a copy of every document I believe I might need in a Dropbox folder. (Dropbox offers 2GB of cloud storage for free.) That way, should I neglect to bring along an important file, I know where to find a copy as long as I have an Internet connection. Access to the office Mac I also leave my office computer running (though asleep) with Back to My Mac switched on. If I get in a jam I can log on to it remotely and copy files I may need to Dropbox. They are now accessible from my MacBook. Regrettably Back to My Mac doesn’t always work because routers you find on the road sometimes block the ports necessary to use it. As a fallback measure, I also have a copy of LogMeIn Free running on my office Mac. As its name implies, this is a free service that allows you to remotely control your Mac from another Mac or portable device. If I need something from that Mac, I just go to the LogMeIn site via my web browser, log into my LogMeIn account, take control of my Mac remotely, and copy the files I want to my Dropbox. 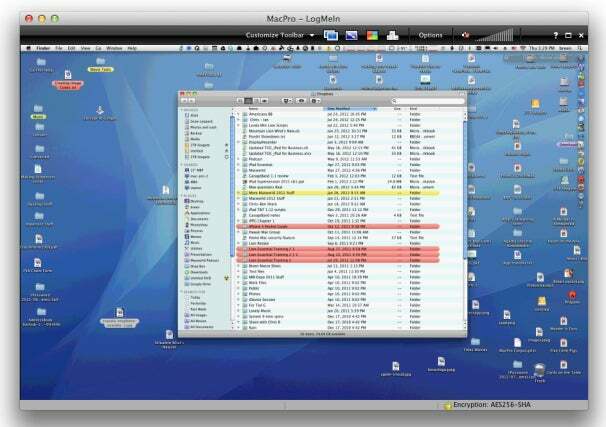 LogMeIn allows you to remotely control your Mac from another Mac or portable device. And then there’s access. In the U.S. it’s not terribly difficult to find free Wi-Fi access in urban and suburban areas. However, if you’re in rural areas (I suppose you could consider the beach rural in some circumstances), Wi-Fi may be nowhere near. In such cases you need another way to make your connection. If there’s a 3G or 4G signal floating around you, you have a variety of options. An iPad with cellular capabilities can make the connection. Going overseas? If you have a Sprint or Verizon iPhone and are a member in good standing (and have had the phone for at least 90 or 60 days respectively), the carriers will unlock the phone, which allows you to use a foreign SIM, thus skirting ruinous roaming charges. Currently, AT&T will unlock only those iPhones that are out of contract—meaning iPhones that are at least two years old. Make sure you have the Yelp app loaded up on your iPad or iPhone so you can find local hot spots wherever you go. Unlocking your iPhone Regardless of the carrier you use, give your carrier’s international service a call to find out about unlocking your iPhone. For Sprint call (888) 226-7212, option 2; for Verizon, try (800) 922-0204 or dial 611 from your Verizon Wireless device and ask to be put in touch with Global services; for AT&T call (800) 331-0500 or 611 from your iPhone and ask to be helped with unlocking your iPhone. If an unlock isn’t available to you, you’re better off leaving the iPhone at home and purchasing a cheap phone and refillable data plan overseas. In the long run you save money by not accumulating excessive roaming charges. Overseas apps The apps you choose to place on your iOS device will also depend on where you’ll eventually end up. For example, if you’re travelling to Europe you might wish to add European maps to a GPS app like Navigon. If you’re planning to spend a lot of time underwater in a tropical location, grab an appropriate fish guide. When visiting a country where you know no more of the native tongue than “¡Albondigas! ¿No te dije?” it’s not a bad idea to tote along a phrasebook app. See Macworld's AppGuide for suggestions. And having a copy of the Yelp app close at hand will help you find local services and hot spots. If you’re reading this article, there’s a very good chance that at least one of your occupations is to serve as the know-it-all tech guru for your friends and family. When you visit some of these people during your holiday, you can expect a load of question and pleas for help. If you willingly provide such service, take along the tools you need to lend a hand. Emergency supplies I always bring a laptop, an external hard drive with loads of free space, my troubleshooting tools, and lots of adapters and cables. With that laptop I can reconfigure networks, remotely access a Mac that isn’t available in other ways, and move data files from my Mac to theirs. There are times when I need to copy lots of data from someone’s Mac so that I can then restore it or perform some other potentially data-threatening job. That’s what the external hard drive is for. With a copy of that person’s data tucked safely away, I can do pretty much anything I like with a family member’s Mac. Troubleshooting software The troubleshooting tools are for what you’d think—pulling a misbehaving Mac out of the soup. Tools I consider essential are Alsoft’s $100 DiskWarrior ( ), Prosoft Engineering’s $99 Data Rescue 3 ( ), and Micromat’s $100 TechTool Pro 6. The easiest way I’ve found to do this is to make that external hard drive bootable and install all the tools I need on it. That way I can boot from that hard drive, make sure that the Mac runs well when not booting from the current startup volume, and then set about repairing or rejiggering what needs fixing on the Mac. Oodles of cables Cables and adapters always come in handy. Mom wants to move her pictures from her point-and-shoot camera to her iPad. No problem. Whip out my $29 iPad Camera Connection Kit adapter and the job’s done in no time. The extended family wants to see slides of my daughter’s recent camping event but doesn’t care to crowd around the MacBook Air’s small screen. Just attach Moshi’s $35 Mini DisplayPort to HDMI Adapter to the MacBook’s MiniDisplay or Thunderbolt port, string an HDMI cable between the adapter and display, and I’m projecting in an instant. (Check MonoPrice.com for versions of these adapters for under $10.) With Apple’s $39 Apple Digital AV Adapter I can do something similar with my iPhone and iPad. Are you prepared for family slideshows? 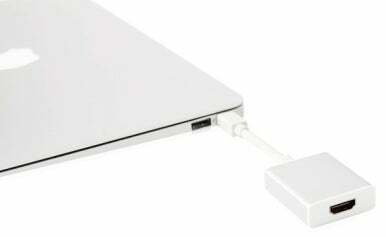 Project your Mac's screen to an attached HDTV with Moshi's Mini DisplayPort to HDMI Adapter. When visiting family I also take along several USB cables. I ensure that I have cables with standard USB connectors, mini connectors, and micro connectors. That way should I need to attach my laptop to a camera, eBook reader, or some other gadget that supports USB, I’m covered. Backup boosters And because I know my family and friends aren’t as aware of the benefits of backing up as I am, I tote along several USB key drives with enough capacity to store their most precious documents. These I copy to the key drive, deliver my lecture on the importance of backing up, and hand over the drive after extracting a promise that they’ll tuck it away in a safe (and memorable) place. Some prefer to unplug completely and spend time away from the technology that normally dominates their lives. And, for many, that’s an admirable goal. But for those who can’t manage it (or prefer to take their toys with them), these tips will help you do so in a reasonable way.